Note: The following article is a polemical (perhaps overly so) piece written in 2012. 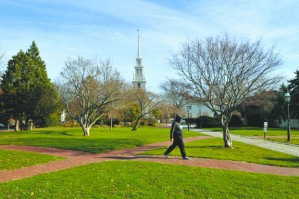 As a result of exhaustive efforts by Doris Duke, a preservationist of Colonial-era buildings in mid-20th Century Newport, Queen Anne Square was opened in the 1970s as a public park of precisely placed plantings and open space at the foot of the City’s historic Trinity Church (built 1725-26). Located on Thames Street in downtown Newport, the 1.2 acre park has changed considerably from its original design. Through the efforts of the Newport Restoration Foundation, the preservation organization Doris Duke founded in 1968, a renovation of the park has been initiated with a controversial design by world-renowned artist Maya Lin as the focus of the project. Change, however, is not new to Queen Anne Square. In many ways, change has been the only substantially consistent characteristic of the park over the site’s history. In order to get a better understanding of the contemporary renovation efforts for the park, an exploration of the role that the area now known as Queen Anne Square has played in Newport’s history – from the colonial settlement right up to the present – is required. For this, the use of historic maps, atlases, period photographs, and other historic resources will be vital for determining a context for evaluating Lin’s design. Furthermore, a discussion of the process for implementing this project in relation to Doris Duke’s intentions for the park is required for a more complete understanding of the context. The area now known as Queen Anne Square is located roughly 300 yards south of Newport’s Washington Square – the psychological and geographic center of the City. Settled in 1639, Newport began as a colonial village, but “eventually became the metropolis of the Colony of Rhode Island and Providence Plantations.” Protected inside of Brenton Cove, this area was an ideal location for ports and wharves, which were vital to Newport’s early maritime economy. With Newport at the forefront, the mid-18th century was New England’s great maritime era – a period marked by prosperity and urban development. Thames Street was Newport’s main commercial thoroughfare running north-south along the harbor. The blocks of Thames Street are short in order to maximize access to the water through side streets that extend eastward – perpendicular to the shore. At the peak of its mercantile enterprise Newport was occupied by the British during the Revolution – an event that decimated the city’s economy, population, and future prospects. Adding insult to injury, upon the withdrawal of the British in the late 1770s, block after block of Newport’s urban fabric were burned to the ground. With the exception of Trinity Church, all other buildings on the site of Queen Anne Square – bounded by Church, Spring, Mill and Thames Streets – were either burned by the British or later demolished in the 1780s by the city due to abandonment. What had been a bustling commercial and residential district in the heart of Newport’s urban fabric was reduced to rubble. Hope, however, was restored for the city’s future by a new economy emerging out of the new nation. Newport’s relatively mild climate and strategic location on the water between major metropolitan areas made it a desirable place to vacation for wealthy families from New York, Boston, and the American South in the early 19th century. Summer cottages and hotels increasingly developed in the city to accommodate visitors – creating a demand for services and commerce, which helped to rejuvenate Newport’s economy in the wake of its role as a major colonial port being greatly diminished in the aftermath of British occupation. As a result of this new infusion of investment, the city was able to begin the process of rebuilding itself. 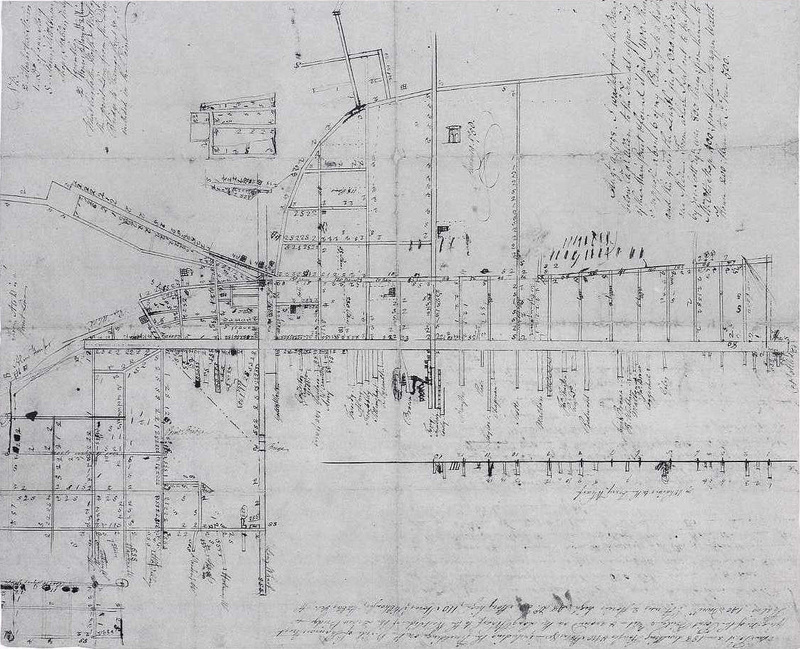 By 1870, the blocks around Trinity Church had developed more densely then they had been prior to the revolution – sporting a mixture of residences, businesses, shops and even a public school building. However, the outbreak of the Civil War temporarily hampered the growth of the city since a large portion of Newport’s visitors were Southern families that made their money through slavery. Fortunately for Newport, capital investment in industrial manufacturing, railroads, and speculative real estate development brought a previously unimaginable amount of wealth to the small New England town during its Gilded Age. Still centrally located in the city during the late 19th century, the area now known as Queen Anne Square was an ideal site for commercial stores, affordable housing for workers, and small shops along Thames Street, which continued to function as the primary network for commerce in the city. Some Thames Street businesses included a hat store, two grocers, and an ice cream and candy shop, among others, which were often located in 2-3 story wood frame buildings with tenements in the floors above the shops. The side streets of Church and Mill provided desirable lots for the substantial homes of investors in Newport’s economy with Frank Street largely acting as a service way giving access to barns, stables and back buildings for the houses on adjacent blocks. George Nason who lived in a two and a half story wood frame dwelling at 26 Mill Street in 1893, for instance, also owned 32 Mill Street, which was a 2-story furniture repair shop, in addition to a small carpenter’s shop located on neighboring Frank Street in the rear of his residential property. As Newport continued to densely develop in the center through the turn of the 20th century undeveloped land to the east became more and more desirable for upper class residences – leaving already developed property west of Bellevue Avenue for newly arriving workers and more intensive industry. By the mid-20th century, the area now known as Queen Anne Square had clearly undergone a transformation from its mixed-use, mixed-income character to a commercial and industrial district. The George Nason house at 26 Mill Street had been, by 1950, converted into a rooming house and his rear buildings had been replaced, along with others, by Egan’s Laundry business. Spring Street between Church and Frank was preserved through the Trinity Church building and its adjacent cemetery, but the block between Frank and Mill changed dramatically in the 1950s with the demolition of the old brick Coddington School building and the replacement of a row of mixed use buildings with a filling station. 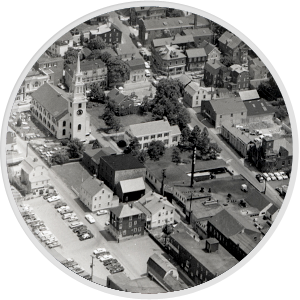 The 1960s saw sweeping changes in Newport as federal funding for urban renewal provided a new tool for cities to use in redeveloping areas like the blocks surrounding Trinity Church that changed in character as a result of industry, demographic shifts, and suburbanization. While Newport emerged from the large scale planning projects of the 60s and early 70s relatively intact, one major change in the city was the creation of America’s Cup Boulevard, which replaced businesses on the west side of Thames Street north of the extended Memorial Boulevard with a multi-lane, high speed roadway that effectively cuts the city off from the waterfront. 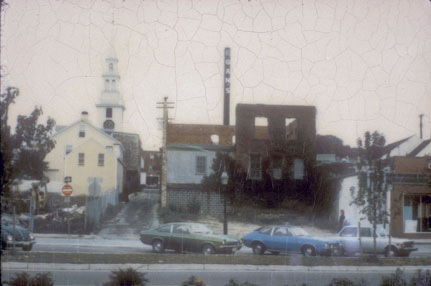 1973 proved to be a turning point for Queen Anne Square with the burning down of the Walsh Brothers Furniture Store – a substantial 3-story commercial block at the corner of Frank and Thames Street. The Redevelopment Agency in the City of Newport saw the large vacant lot on Thames Streets resulting from the fire and the other abandoned properties as an opportunity for the area’s future use as residences, parking, and a small park. The result of these efforts was the creation of a new public green space on the site of a declining commercial area in the center of Newport. One notable characteristic of this project is that it effectively created a village green for a religious institution, which is in opposition to Rhode Island’s founding and guiding principle of religious tolerance and a separation between public life and religious institutions. Originally, the park functioned as a landscape of precisely placed plantings and trees, but by the mid-1980s, a new system of paved paths reflected the circulation needs of visitors and passersby. However, despite these changes the park has not seen the active use and maintenance envisioned by its creators. 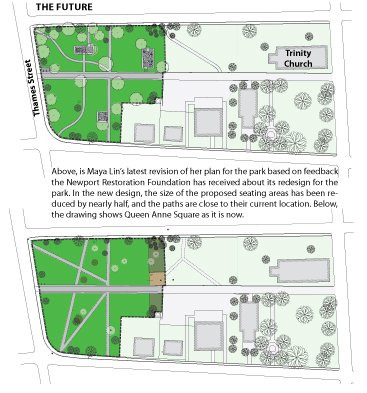 Therefore, in celebration of what would be Doris Dukes’ 100th birthday, the Newport Restoration Foundation has commissioned Maya Lin to renovate and redesign the park. Lin’s interest lies in the communicating the site’s history through this new art installation. 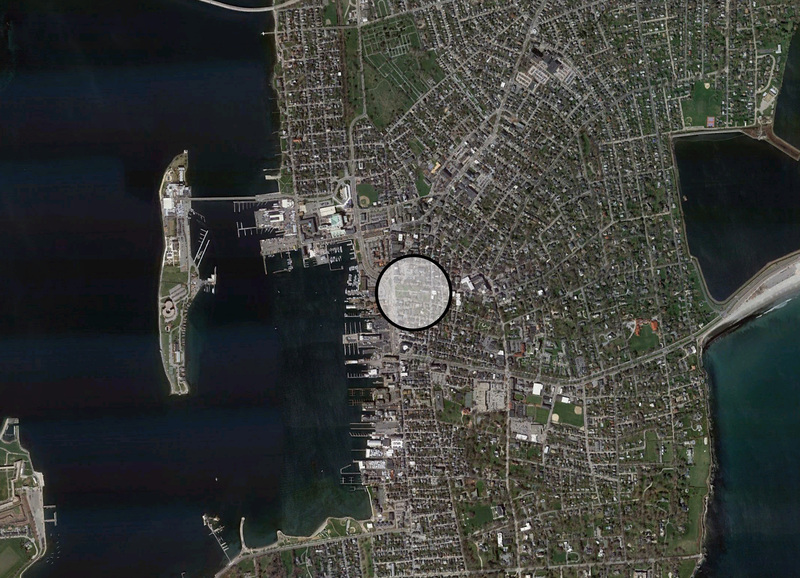 As Lin states, I am excited and honored to be creating a work at the center of historic Newport. My interest in time, memory and history originally drew me to learn about the rich history of this area and discover the structures that once existed at this site. To be able to create a landscape that reveals the historic aspect of Queen Anne Square in which these physical structure, some of which have stood here for 300 years, hold the history of the people who lived and worked there through time, is an important aspect to me and the project. The design is about sharing these spaces with the public. The foundations are created from reclaimed stones that were once part of historic homes. In doing so, we are building foundations that represent home, family and community through history. 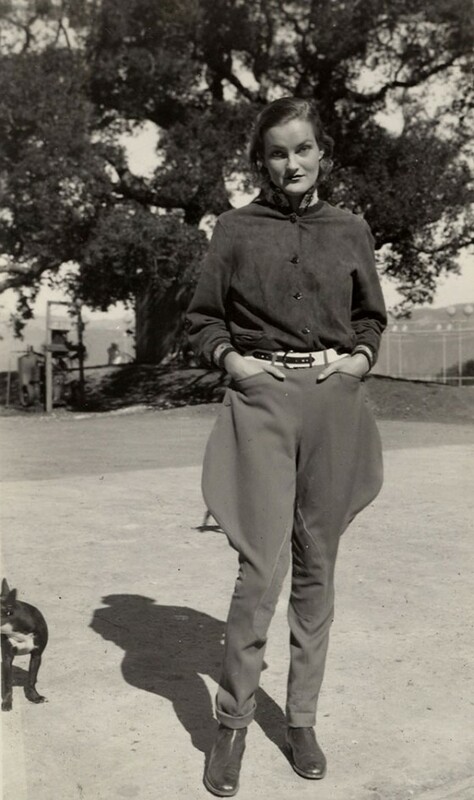 I image it to be a place where people gather together and also can reflect upon how Doris Duke helped preserve so many of these significant houses. In addition to new stone foundations, the design incorporates a new system of walking paths, and new tree plantings selected specifically for the site. It is important to determine if the stated intent of the design is, in fact, an appropriate honor for Doris Duke and if the new installation relates adequately to the history of the site. Significant changes to Duke’s design were already made in the 1980s with the creation of a paved path system in what had previously been entirely a green space. Duke’s precisely placed tree plantings, however, do remain to this day. Lin’s redesign calls for the removal of nine mature trees on the site, and a reworking of the network of paths from linear to curvilinear. Maintaining the view lines to Trinity Church and winding paths definitely align with Duke’s desire to highlight the Newport landmark and create an organized landscape that is functional for the public. The removal of trees, however, certainly seems a peculiar homage to Duke considering the careful thought that was put into their original placement. Furthermore, while the idea of foundations suggests the history of the site, the creation of Queen Anne Square was meant to remove the history of the site and create a new space in the city that related to Trinity Church and the 18th Century colonial housing of the city. The shallow stone foundations are placed where colonial residences once stood, which in a way does also tie into Duke’s intent for the site, although not in the way she originally envisioned it. As an honor to Doris Duke, the new design succeeds in its relation to 18th century colonial houses, its maintenance of most of the existing trees, and its curvilinear paths, but it falls short in the removal of trees, and the semi-inhabitable new construction within the green space of the park. Like the homage to Duke, the design’s intent of connecting to the site’s history is only occasionally successful. The stone foundations are meant to identify the location, scale and material of foundations of 18th century colonial residences. This area as a site for residences and 18th century buildings is only a small part of the history. By the mid-18th century, Newport was at the height of its colonial maritime commercial development with Thames Street at its heart and the blocks of Church, Frank and Mill fully integrated into the dense, built up urban fabric of the city. The new design completely ignores this side of the 18th century history. Furthermore, the site was largely rebuilt in the 19th century with the addition of small shops, a large public school building, a mix of housing and even a firehouse. Even the 20th century saw the addition of industrial scale buildings like the Egan’s Laundry business. This character of the site is completely ignored in the new design. Rather than telling the entire history of the site, Lin’s foundations tell only a certain story focused around a few modest houses of the colonial era. Although the new design does maintain many of Duke’s existing plantings, relate to her admiration of colonial housing, and retain some of the characteristics of the 1980s path system, the design completely overlooks the sites commercial, and late-19th and early 20th century history. Lin’s design falls short of communicating the history of the site to the public by highlighting some aspects of the site and not others, which results in an incomplete story. Two issues with the new stone foundations are that they are not accurately being reconstructed in that they are designed to be handicapped accessible and shallow for use as seating. Secondly, the use of historic stones may give the wrong impression to visitors that the foundations are remaining on the site from colonial times, which is not accurate. The new construction will have to be clearly identified as an art installation on site to ensure it is not misunderstood by the public. On the topic, Lin states that, “Newport does have a very storied past, and I want to tap into that. Are we trying to recreate it? Absolutely not. That would be Disney World, and I don’t do that. But I always do try to be extremely contextual in my work.” While there is significant new construction that rides the line of reconstruction, ultimately the design is an art installation that is difficult to judge at an objective level. Most troubling about the redesign of Queen Anne Square, however, has been the public process surrounding the project. For a design that is meant to revitalize the community around the square, there has been a notable amount of public opposition and dissatisfaction. By directly commissioning Maya Lin to design the renovation for Queen Anne Square, the Newport Restoration Foundation circumvented the public, resulting in a project that could only be cosmetically changed through subsequent meetings and hearings. The public process surrounding the project begged for a better model to incorporate the city residents, especially for a design that aims to exemplify the unifying and rejuvenating effects of preservation work. The most dramatic change in the area was the creation of a public park – Queen Anne Square – over the remains of this once bustling commercial district. 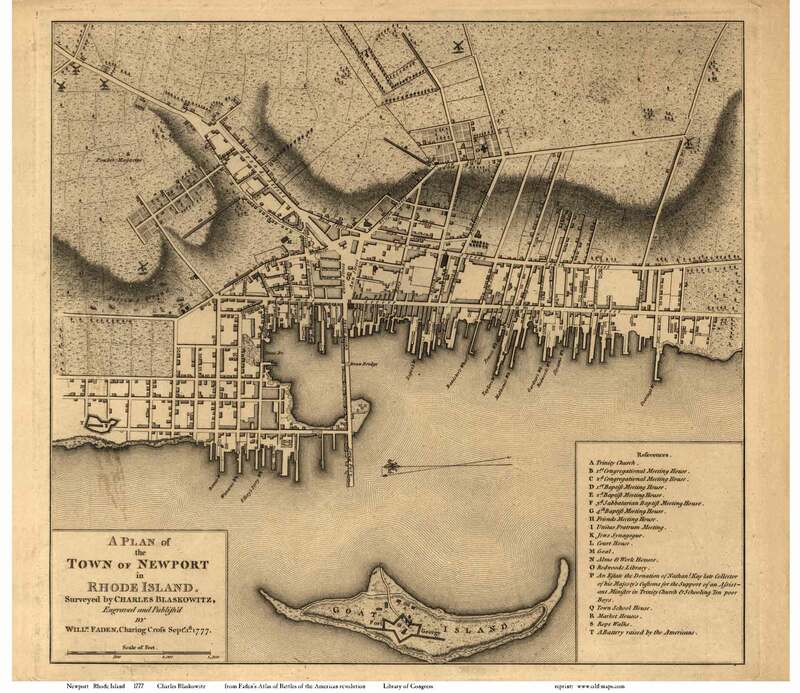 In the colonial maritime era, the role of this area had been to provide valuable land near the active ports of the Newport harbor for mercantile enterprises and residences. The 19th-century saw the rise of an economy geared towards speculative real estate development, commercial retail, and manufacturing. 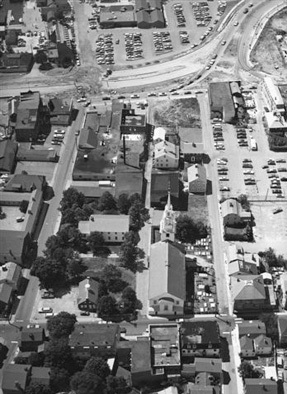 By the mid-1970s, the role of Queen Anne Square was to provide Newport residents with better housing options facing a public green at the foot of one of its iconic colonial buildings – Trinity Church. Now, in 2012, another change is occurring by once again constructing on the site in the hopes of better accommodating the public and encouraging a more active use of the park. Maya Lin’s design for the Queen Anne Square renovation project would have benefitted from some key changes to the design and scope of research in order to better meet the goals of the stated design intent, which included memorializing Doris Duke’s preservation efforts in Newport, revitalizing the community around the park and connecting to the site’s history. First, all of Doris Duke’s carefully placed plantings that remain on the site should be maintained as an indication of Duke’s original design intent for the park. Second, if stone foundations are to be constructed, they should relate to structures that existed throughout Newport’s history – not only its colonial residences, but also maritime commerce, small 19th century industries and shops, and 20th century buildings. Third, it is imperative to include the public in the planning of the project if their acceptance of the project is desired. For a site that was once privately built by individuals who were Newport residents, then given over to the general public as a park, the process by which Queen Anne Square has been removed from their control in order to execute the current renovation project has been dissatisfactory. The Newport Restoration Foundation has completed the work of cutting Newport residences off from Queen Anne Square that began with the construction of America’s Cup Boulevard. As the Washington Square Roots initiative demonstrates, it is possible, and actually preferable, to bring the public into the discussion about planned projects at the beginning. This results in projects that are generated from the needs of residents. Once projects are identified through a public design charrette process, then a public design competition can be held as it was for the Vietnam Veterans Memorial. A hybrid elected and appointed board can then select the most appropriate design and allow the professionals to execute their winning design. The alternative is the dysfunctional system used for developing the Queen Anne Square renovation in which the project is privately planned, the designer is privately commissioned, and then the public is brought in afterwards to give the appearance of transparency and inclusion. This is an inadequate process that remains from the 1960s and 70s when disparate opposition was organized into coordinated protesting against top-down decision-making. For most of American history, government was a relatively weak force in everyday life, and civic art was often the result of private donation from a wealthy individual or a special interest group and was not subject to public scrutiny. However, by the mid-20th century, municipalities had gained significant control over private property rights in the form of zoning ordinances. Furthermore, federal funding in the immediate post-WW2 era gave enormous capabilities to local government agencies, which was used to enact large scale urban planning projects. Eventually, protests against the Vietnam War and other social movements began to reform these large efforts and, in some cases, put an end to them. In the planning community, the result was to keep the traditional model of top-down planning, but with a new public process aimed at giving the appearance of public input, which could lead to, at best, cosmetic changes to project. Fully realizing the reform efforts of the 60s in the form of a grassroots, publically-generated project planning process followed by a design competition overseen by a hybrid board of panelists is long overdue. Future planning initiatives in Newport would benefit from an approach more like the model used for Washington Square than for Queen Anne Square.